At 8:30 on Monday night Resident Assistants for Social Justice Education painted the spirit rock across from the North Parking Garage with the phrases “Black Lives Matter” and “Racism: In Storrs Now” with intentions of mirroring last semester’s incident between the Alpha Kappa Alpha sorority and Pi Kappa Alpha fraternity. “We wanted people to remember that racism still exists and it happens on Storrs campus and to not forget the idea that ‘Black Lives Matter’ still exists,” said UConn senior Prekiya Kennebrew. 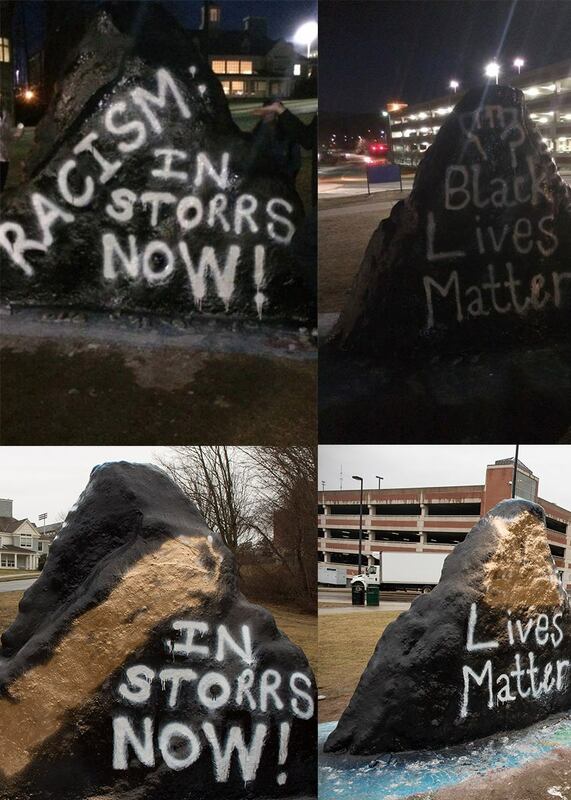 By 10:30, just two hours later, the rock was defaced, with gold paint covering the words “Black” and “Racism”. UConn senior Tyler Williams posted pictures of the rock on Tuesday afternoon and watched the post gain attention quickly among his peers. While Williams says many of the people who commented identified the problematic nature of the erasure of the words “black” and “racism,” he says there were also comments that were defensive. “You’ll see a lot of comments where people are trying to justify the erasure of certain words and to find alternative explanations other than the fact that this was an anti-black incident, which is what this exactly was,” Williams said. Since posting the pictures yesterday, he has received a few hate messages from people in surrounding communities and he says he’s anticipating more. Despite the messages, Williams says that several people have been very articulate with rebutting those who are upholding anti-black and racist views. “I think that, based on the people who have jumped into this conversation that maybe there are some really serious, productive ways that this can move forward,” Williams said. Kennebrew says that students have raised awareness by posing important questions. “‘What does this mean?’ and ‘What’s the issue of erasing black?’. Why not keep ‘Black Lives Matter’? What is the problem with saying ‘Black Lives Matter’? ‘Why are people denying that racism exists on Storrs campus?’” Kennebrew said. Based on issues she’s had dealing with students as an RA and racial slurs that she’s been called on campus, Kennebrew says the vandalism didn’t surprise her. Kennebrew says that until the UConn community realizes and accepts that racism happens in Storrs, progress will not be made. UConn spokeswoman Stephanie Reitz says UConn administrators and police learned Tuesday of the change to the original message painted on the rock and are reviewing it. Williams says that this incident is not the first, and certainly won’t be the last. With hopes of the conversation continuing about social justice issues and how it pertains to the UConn campus, Williams says that students are not the only ones who should be held accountable. “We’re all responsible for it, every single person,” Williams said. You’re missing the point. By saying “black lives matter” you’re automatically differentiating an entire race from everyone else. Erasing the word “black” erases this hypocrisy and it was brilliant. Removing “Black” from Black Lives Matter devalues the struggles that the Black community routinely undergoes. It silences the voices that must be heard at this time due to the disproportionate and unjust killing of Black bodies in relation to any other demographic in the U.S. If non-Black communities were being treated in this same manner, perhaps the All Lives Matter movement would be something worth considering. But it isn’t, and therefore your argument to remove the “Black” out of a movement created by and for Black people, is ridiculous.